A Cristen Farrell Photography Senior Rep is a local high school student (Santa Clarita Valley & Castaic only) who is a graduating senior in 2012. Senior Reps are responsible for representing Cristen Farrell Photography to friends, classmates, relatives, etc. through the use of Senior Rep Cards and a Brag Book. The goal is to refer as many people as possible, in order to earn great benefits in return. Referred sessions can be any type of session, not just Senior Portrait Sessions – family, newborn, lifestyle, head shots, etc. What are the benefits for being a Cristen Farrell Photography Senior Rep? A complimentary 1 – 2 hour natural light, on location Senior Portrait Session with Cristen Farrell Photography. Senior Portrait Session includes fashion and design consultation and up to 3 outfit changes. Reservation required. Makeup and hair services available through Sara K – please inquire. 50 custom designed Senior Rep cards to share with your friends, family, etc. Additional cards available by request. What does the referred person get? 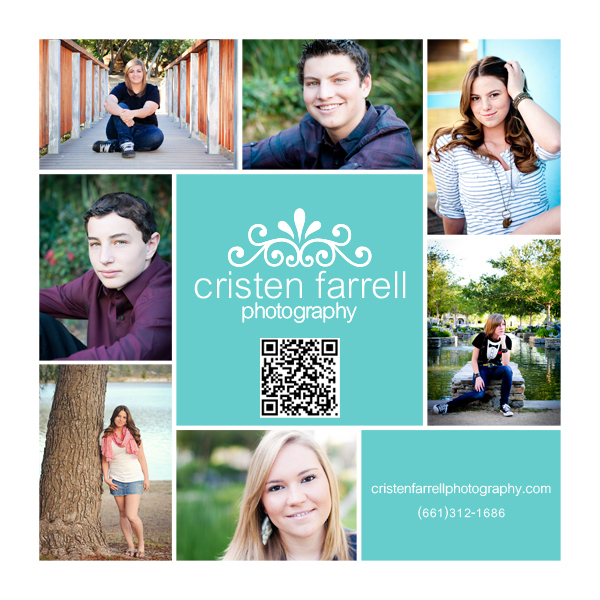 Any referred person who completes a photo session with Cristen Farrell Photography will receive a complimentary 11”x14” e-Surface print upon presenting your Senior Rep Card. Please note that the referred person is required to complete a model release. What is Cristen Farrell Photography looking for in a Senior Rep? We are ideally looking for one girl and one boy from each local high school, however this may be adjusted based on applications received. Ready to be a Cristen Farrell Photography Senior Rep? Click on the Senior Rep tab and then choose Senior Rep Application.